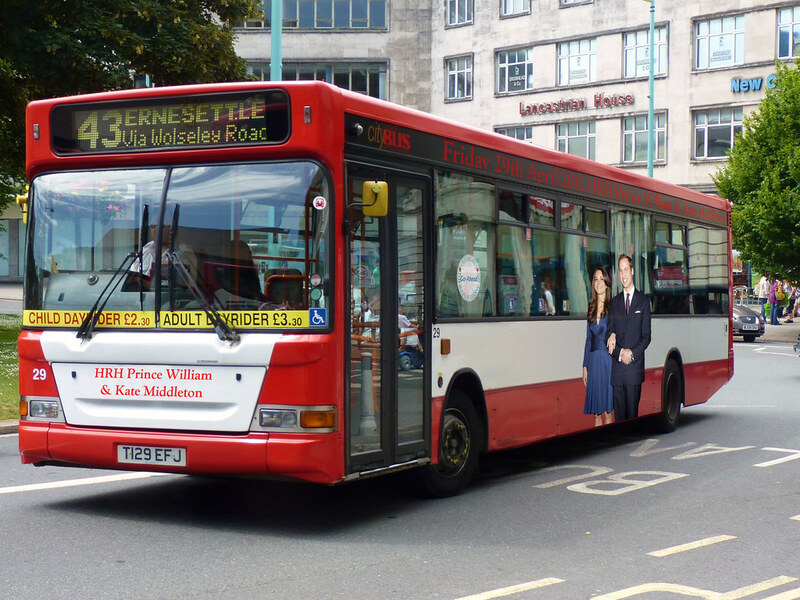 Plymouth Citybus are commemorating the Royal Wedding in April with this special livery on Dart 29. It will be on the road in this scheme until the end of the month. The original plan was to use Volvo B7 Plaxton President double decker 429 (reg tbc) numerically the last of the batch (420-429) due from Go Ahead London as it fitted with the date April 29th. This would have had the added advantage of being in the new Citybus livery so would certainly have stood out more. This plan had to be changed as the Volvos originally due in February have been delayed and have still not arrived in Plymouth. The Volvo Plaxton Presidents from Go-Ahead London that were due in Plymouth, I believe could be still being used on Metro replacement duties in Newcastle upon Tyne. There are currently over twenty of these 'V' registration vehicles in use at the moment, so could it be that Citybus are getting ten of these buses? See Jeff's Bus Lane for details/pictures. Well the PVLs we are due are indeed overdue (I dont think its the ones in Newcastle but I could be proved wrong) - we were due X and Y regd buses but that could have changed. And yes - it is a photoshop!